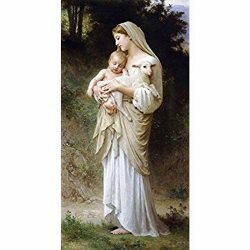 Inspired by "L'Innocence," Bouguereau's painting of the Virgin and Child with a lamb, this cologne is made from the finest essential oils. Its fragrance is soft and ethereal with a gentle opening ripple of cool lavender and a lingering, powdery undertone of freshly-ironed linen. From the maker of THE POPE'S COLOGNE. 2 fluid oz. spray bottle, gift boxed.